The third national steering committee for the Fund for Women, Security and Peace, chaired by the Chairperson of the Higher Committee for the Advancement of Women, Dr. Zekri Alloush, participated in the meeting of the Secretariat General of the Council of Ministers. The Humanitarian Coordinator of the United Nations Development Program in Iraq Marta Ruydes, Zorba, the representative of the United Nations Population Fund (UNFPA), representatives of the British and Canadian embassies and representatives of the Ministries of Planning, Labor and Social Affairs. During the meeting, the WPHF grant mechanism for civil society organizations, amounting to US $ 2 million over a two-year period, was discussed. Proposals for project amounts of not less than US $ 100,000 and not more than US $ 300,000. 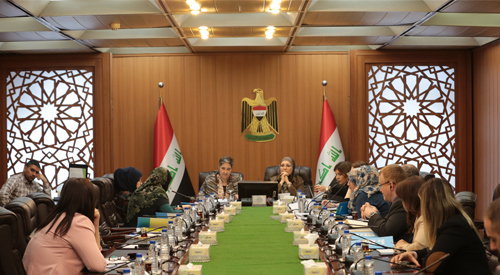 The meeting outlines specific criteria for selecting projects, focusing on diversity and inclusiveness to include the application package for all civil society organizations in liberated areas, central and southern governorates of local and community women's organizations, and emphasizing the organizations that worked on resolution 1325 and organizations that had not participated before. And encourage joint civil society organizations' projects. Emphasis is placed on projects focusing on humanitarian relief and counterterrorism programs. The maximum duration of the project is two years for 2020, the establishment of workshops to assist small organizations in project writing, the recommendation to submit the evaluation report over the next two months, For women working on the first grant.